I want to introduce You a little mod, which aims to add some fun to the environment and add to the minecraft world something useful. This mod brings salt to the world!!! From the salt ore you can get salt. With its help, you guessed it, it is possible to pickle food! So, with the help of salt you can neutralize rotten flesh, although expense in this case will be much greater, as many as eight pinches. Using salt, you can entice cows and horses, as well as feed them. Well, the last speciality - the salt crystals! Find them can only luckiest miner) They grow only on salt ore at a depth of less than 40 units, and where there is no direct sunlight. Mined with silk touch tools. For normal growth of crystals you will need to assemble construction of any five salt blocks (see. picture), pour water around, hide all this from the rain and light and wait. Salt crystals grow in several stages. Be careful! Obtain salt can only be fully grown. Also, based on salt can be prepared some new dishes. And finally, this little mod changes the world around, adding a dry salt lakes! There are extremely rare, but it is an excellent source of salt. Just added this type of soil as saline soil and the plant saltwort, grows only in these soils on the banks of the salt lakes. This plant is valuable to its healing effect. From the saltwort can make salads, pies, it can marinate or consumed raw) All these products have different strength and duration of the effect. Also, if you mix the ashes of saltwort with water, you can get a fizzy drink, relieve you of all the effects and extinguishing the fire, if you suddenly caught fire. Like other types of plants, saltwort can be grown, but in the process has its own characteristics. Also, you can find the crops of saltwort in desert & jungle temple. For the growth of saltwort does not need water, but need sunlight. Saltwort can be grown on saline soil only. On the other types of soil including sightly saline soil, he dies. Each stage of growth saltwort makes the soil a bit less salty. This can be determined by the color of the ground. The saline soil is transformed into sightly saline soil. In order to re-plant saltwort at sightly saline soil, it is necessary to add salt. You can do this on the craft table or by right-clicking on the sightly saline soil with pinch of salt in their hands or with dispenser. At each stage of growth saltwort give a different number of crops. The larger the plant, the greater the harvest. At the final stage of growth saltwort can be cut with shears. Thus the plant itself remain at the stage at which it does not die and in the future can continue to grow. 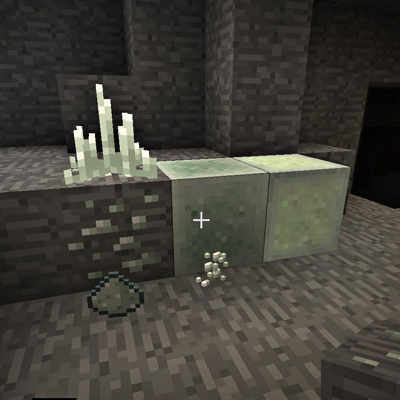 Plant growth can be accelerated in the area of 3x3 block by using bone meal in hands or with dispenser. Just saltwort is capable of giving shoots on neighboring blocks of saline soil. Mud Mask is the armor. It is not very strong and does not protect you from much damage, but the mask improves your health and slowly restore it. Just mask extinguish you if you put it in its entirety. Now salt can be obtained by evaporation!!! To do this you need to craft evaporator. Evaporator may be filled by right-clicking with bucket in hand or by fluid block above it. Remember, however, where there is steam, and there is pressure. Never block the outlet of the extractor until it works. Ho-ho! You thought that this end the useful properties of salt? No wonder that the salt can change the weather? Yes! If you spray it above the clouds, you can make rain. Now you can craft the Rainmaker! Key parameters of the generation salt lakes and salt taken out in the configuration file. Fizzy drink now works correctly! Let me know about bugs, please. And ... the mod is completed..? I think that many who use the version 1.7.10 are faced with the disappearance of Empty Buckets after crafting. Unfortunately, I was not able to solve the problem nicely. Therefore, I decided to go through curves. In this version Buckets of Water behave normally. However, this had to change the recipe of Milk Bucket. Now you need to mix Powdered Milk , the Bucket of Water and Empty Bucket! Then you get a Bucket of Milk and an Empty Bucket. Yes! This is not a elegant solution. But the only way I was able to save the mod functionality. And my new game: 26-PUZZLE !!! Hello, i very like your mod! I have one idea, but first answer my question, to you know mod Quark? But the recipes seems to work fine. It is difficult to say what is the reason, since the recipes work. Does the error repeat? It didn't repeat after server start. I've removed "Salt:dust" from UniDict customUnifiedResources (and did more stuff cause I got the error few days back but only reported it yesterday) and it's gone now. I've also updated harvestcraft (that's the source of other salt). should I take it with a grain of salt? At the moment, I'm just fixing bugs. No innovations are planned in the future, since the main forces were deployed in another mod. Seems like Salt Ore doesn't like high level fortune, as it seems to always give around 2 Salt per ore with high enough Fortune (like Fortune 6 from Astral Sorcery but even Fortune III doesn't give a lot more than Fortune II). Yes, perhaps it is. I do not remember, but most likely I made a limit on fortune, since there are no high values in the vanilla game. The MOD is in Spanish? ... and if not, is there a possibility that the MOD will be translated into Spanish? And some other uses for bread, as it doesn't have many. Also, was wondering if an english update can be pushed. The translations are quite off, and I'm sure an update on that would be some really nice polish. Thanks for having a simple and good food diversity mod! Unfortunately, at the moment I can not engage in mod. Does this mean I could make a fork of your mod? If so, I wouldn't mind helping out with your mod. I would probably start tonight when I get home, most likely with translation. Might also fix your ore recipes. Running salt ore through a crusher or similar machine only gets 1 pinch of salt. A separate mod for recipes and all that.